Yet another beer from a new place - Argentina. Like the Tusker I drank right before it, a very clear and pale lager. The head on this one was minimal, with just a courtesy skim of bubbles left on top. A few bubbles continue to be active in the glass. Lots of grass and a bit of sharp fruitiness on the nose of this one. Almost like a cider. It doesn't put me off, but it doesn't really entice me, either. The first taste was actually a bit better than I thought it would be. There is just a hint of a malty roundness to it, but the flavour on this is all grass, corn / rice, and some fruitiness. The fruitiness comes with an acidity that's too strong in the feel and finish. Overall, the feel is watery and light. Not the worst lager or beer I have ever had by a long shot, but this one isn't worth seeking out. Hey Stephen, in an amazing coincidence, I can also attest to the taste of this beer. Being in Buenos Aires right now, I've had a chance to try it out as well. I can agree with your assessment. 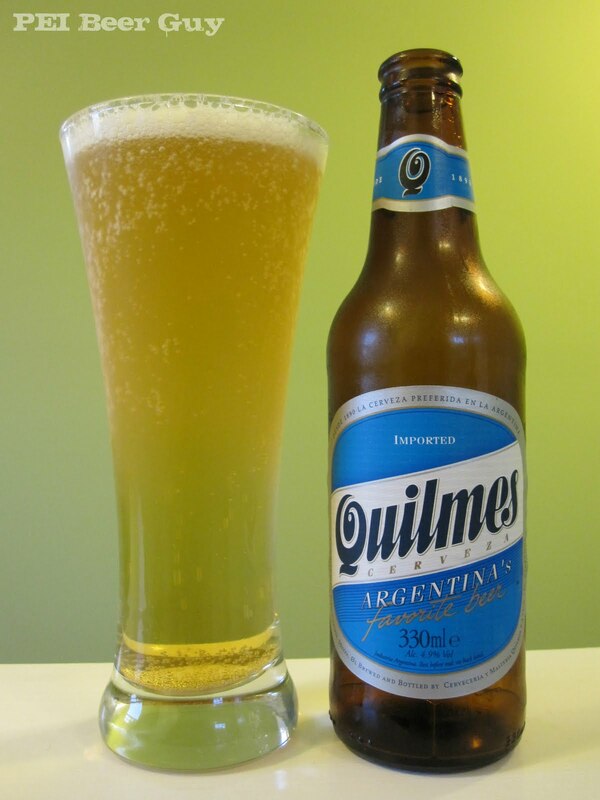 A nice Argentinian steak definitely increased my liking of the beer! I agree, loved it whilst in Argentina. Does anyone know whereabout you can buy it over here(Canada)? I'm in Ontario and cant seem to find it at all but hear it might be available in Halifax. Any help would be apprecuiated, cheers! Hi, James. The bottle I found was at Harvest Wines & Spirits in Bedford, Nova Scotia. I wouldn't bother putting much effort into finding the beer, though!